Pre-Paid EQ K2+D3 is only one delivery, after this you will continue to receive the product in your auto order as long as you wish. You can change your auto order whenever you like on My account or by contacting the customer service . 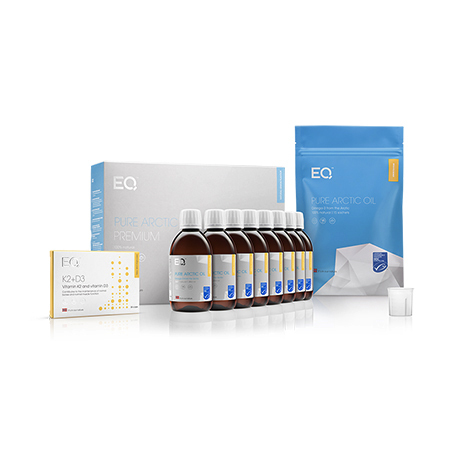 You will receive 6 packs of EQ K2+D3 in one delivery. Clinical studies show that our bodies need a daily intake of at least 180 micrograms to achieve maximal beneficial effect. 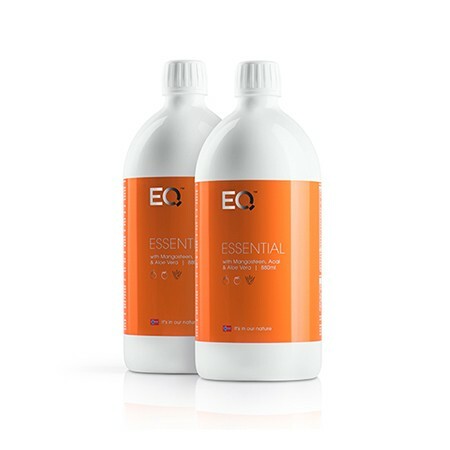 EQ K2+D3 therefore contains 200 mcg, and 40 mcg vitamin D3 in each daily dosage 1 capsule. With the help of a simple self-administered device you can quickly receive your serum-concentration of vitamin K2 (MK7). The vitamin K2 «concentration-number» in your blood gives you an indication of your relative risk to develop cardiovascular diseases and/or weak bones. The blood sample collected on the filter paper in the K2-test device will be extracted and analysed according to international standards for vitamin K2 testing by Vitas AS Laboratory in Oslo, Norway. 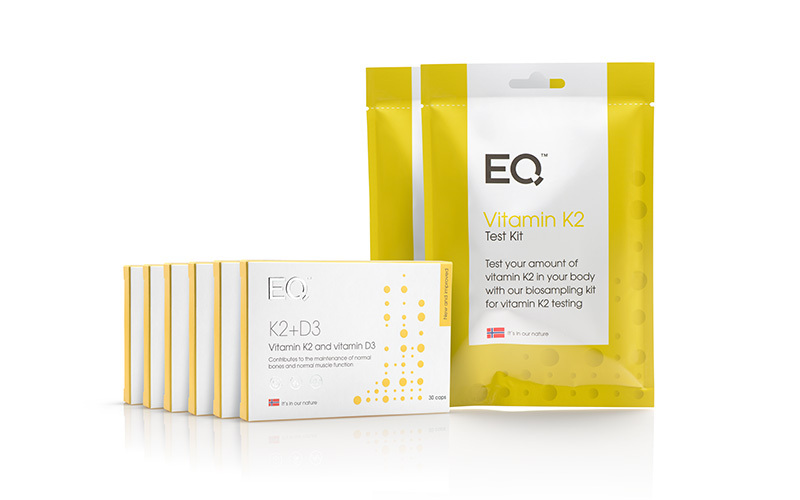 This Pre-Paid includes two EQ Vitamin K2 Test Kits. 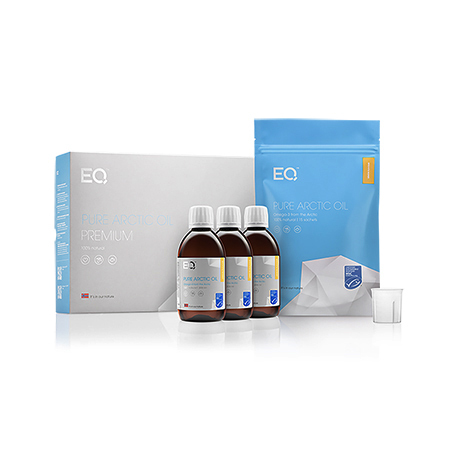 Your results will be available on omegaratiotest.com/en after 15 -20 business days. Vitamine K2 (menaquinone-7), flaxseed oil (Linum usitatissium), vitamin D3 (cholecalciferol), gelatin (capsule), stabilizer (glycerol), coloring (iron oxides and hydroxides). This analysis measures serum-concentration levels of vitamin K2 (MK7) in the bloodstream. The concentration-number provides an indication of the relative risk to subsequently develop cardiovascular diseases, weakness in the bones. The recommended serum-concentration level of vitamin K2 (MK7) in the bloodstream is 5.0 ng/mL or above. A level below 2.0 ng/mL indicates there an elevated risk of developing osteoporosis and cardiovascular diseases. Research shows* that vitamin K2 inhibits the development of osteoporosis and arterial stiffness. Vitamin K2 facilitates the binding of calcium to the bone matrix and secures the maintenance of strong and healthy bones. Moreover, vitamin K2 facilitates the processes necessary to remove calcium from atherosclerotic plaques and damaged areas in the inner surface of the arterial wall. Maintaining a sufficient serum-concentration level of vitamin K2 is therefore important to protect bone structures and cardiovascular health. 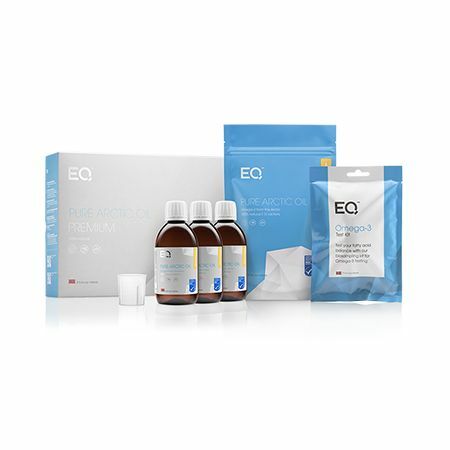 We have designed EQ K2+D3 to ensure a stable serum-concentration level above the recommended 5.0 ng/mL. By consuming the recommended daily dosage on a regular basis, the risk of osteoporosis and cardiovascular events should be reduced by approximately 50%. *Sources: Geleijnse, JM et al: Dietary intake of Menaquinone is associated with Reduced Risk of Coronary Heart Disease: The Rotterdam Study. J.Nutr. 134: 3100 – 3105, 2004. Please consult your doctor if you are on oral anticoagulants, pregnant or planning to give the product to child under 1 year of age. Download our manual or see our video below on how to perform the test.